Computer-Aided Design is a hands-on program, and you will spend most of your day learning by doing. You will prepare drawings under the guidance of instructors who are true experts and will graduate with the abilities and knowledge that set you apart from the crowd. Are you interested in our Computer-Aided Design Degree Program? 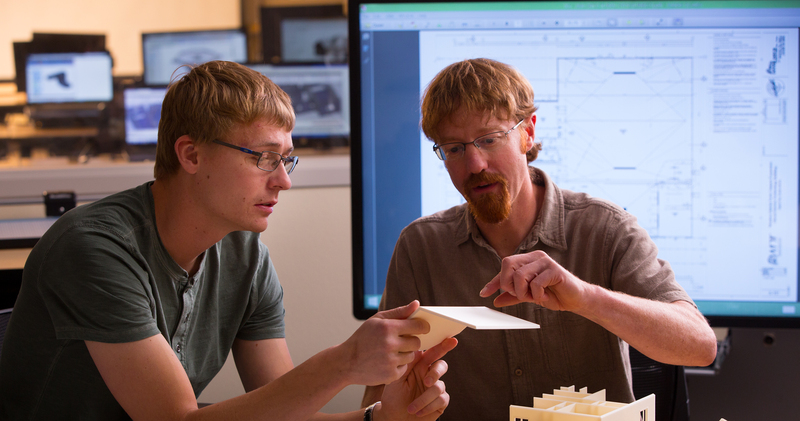 The Computer-Aided Design program at Western Dakota Tech equips students with the skills and knowledge necessary to produce accurate technical drawings using industry standard CAD systems. Graduates of the 18-month program receive training in a full range of knowledge and skills needed to succeed in the diverse and varied field of drafting and design. This degree is widely accepted as the industry standard in qualifying for an entry level position in the architectural, civil, and mechanical CAD fields. Architectural drafters assist architects by preparing technical plans and details showing the dimensions, construction materials, and processes used for residential and commercial building projects. Mechanical drafters prepare detail and assembly drawings of a wide variety of machinery and mechanical devices, indicating dimensions, fastening methods, and other requirements. Civil drafters create drawings that detail the construction related to land, roads, bridges, and other infrastructure. The Computer-Aided Design program at Western Dakota Tech provides students with a solid base of knowledge in all three of these fields, maximizing their versatility when entering the job market. CAD Technicians produce technical drawings with advanced 3D software. As a CAD Tech you will be entering a career as an integral part of an architectural, civil, or mechanical firm. Architectural drafters assist architects by preparing technical plans and details showing the dimensions, construction materials, and processes used for residential and commercial building projects. Mechanical drafters prepare detail and assembly drawings of a wide variety of machinery and mechanical devices, indicating dimensions, fastening methods, and other requirements. Civil drafters create drawings that detail the construction related to land, roads, bridges, and other infrastructure. The Computer-Aided Design program at Western Dakota Tech will provide you with a solid base of knowledge in all three of these fields. Our recent graduates are now employed by, Caterpillar/RFA Engineering, West Plains Engineering, Rapid Fire Protection, Skyline Engineering, Ferber Engineering, KLJ Engineering, Architecture International, Albertson Engineering, FourFront Design, Upper Deck Architects, and other businesses.